With this bike phone holder you can enjoy music while riding, also convenient to use app map for navigation. Created from a premium lightweight CNC-machined aluminum alloy to highlight metallic texture. Super texture, stable and firm, super durable, four claw button easier to fix the phone. 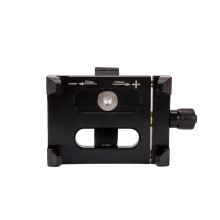 The length of the holder can range from 50mm to 100mm that is suitable for 3.5-6.5 inch phone. Bicycle mobile phone holder can be simply and quickly installed in front of the handlebar or stem cover. Grip Diameter: 31.8mm / 1.25"